Creates channel(s) to generate digital pulses that frequency and duty cycle define. The pulses appear on the default output terminal of the counter, unless you select a different output terminal. counter specifies the names of the counters to use to create the virtual channels. 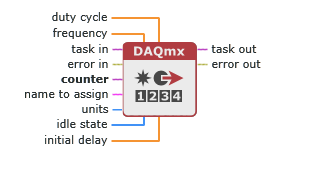 The DAQmx physical channel constant lists all physical channels, including counters, for devices installed in the system. You also can wire a string that contains a list, or range of counters, to this input. If you have an array of counters, use the DAQmx Flatten Channel String node to convert the array to a list. units specifies the units in which to define pulse frequency. idle state specifies the resting state of the output terminal. Terminal is at a high state at rest. Terminal is at a low state at rest. initial delay is the amount of time in seconds to wait before generating the first pulse.